Frequency inverter/power conditioner with 230V/50Hz output, square wave. For European Hammonds to be used in US (60Hz) or on instable 50 Hz mains (accepts 40 to 400 Hz input), i.e. to stabilize organ tuning on mains from mobile power unit. Fits all electromagnetic Hammonds including those with self-starting motors (L-, H-, T-series). Crystal stabilized circuit, no deviation from set frequency. Simple installation, is looped into wires to run motor. Step-up transformer 117V/230V required (not included) for use in US (117V mains). Recommended power rating 160 VA (organ) or 400 VA (organ and Leslie). Following instructions describe installation in B3-/A100-Series consoles. For other/older models, refer to service manual of your organ and consult an organ technician. The SQC-50 simply has to be inserted into the run motor’s supply wires. Desolder run motor’s wires (two pairs red/black in parallel - do not separate them!) from generator’s wire panel and connect to SQC-60 output terminals #3 and #4 (terminals #1 and #2 are not present). Connect 230V input terminals #5 and #6 from SQC-50 to former motor terminals (middle and rightmost of 7 terminals at console organs, seen from behind) on generator’s wire panel. Leave all other cables going to generator terminal untouched. Wire length and polarity is not significant; motor wires may be extended by wires capable of mains voltage only. Use shrink tube for insulation. Connect PE terminal #7 to generator chassis ground and, if present, PE terminal of mains plug. Terminals may be pulled off for easy de-installation or exchange. A LED inside the power conditioner will flash five times rapidly when powering up, also when tuning changes. It will blink slowly in normal operation. To replace the fuse, open case (4 self-tapping screws on sides). Only replace with rated fuse 5x20mm (1.4A or 1.6A slow-blow). 230V/50Hz organs require installation of a 117V/230V step-up/insulation transformer to be used on 117V mains. Remove power cabling and old mains plug and replace with IEC socket with proper cabling, including PE (protective earth, green/yellow wire) as shown. A 240VA transformer is sufficient for B3- and A-100-type organs. If a 230V Leslie is to be powered from organ's step-up transformer, a 400VA type is recommended. 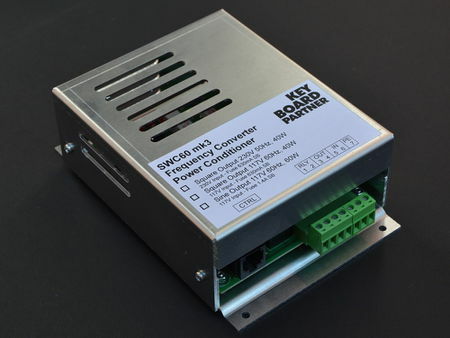 The PCC power conditioner controller unit is an optional accessory for remote controlling of our new series of Power Conditioners SWC-60, SQC-60 and SQC-50 mk3. It has a built-in LCD and rotary encoder for simultaneous transposing/tuning in half note or cent steps, i.e to achieve orchestral tuning. Box is attached by RJ45 patch cable (1.5m included) to CTRL connector of SQC-50. Controller box may be mounted in reach of organist by velcro tape. Always switch organ off before attaching/removing PCC unit! The PCC has a built-in display with two rows. Upper row shows transpose value (plus/minus 6 half note steps), lower row shows fine tuning in cent steps. On power-up, locked mode is active. Press knob to enter transpose mode, indicated by an arrow pointing to NOTE number. 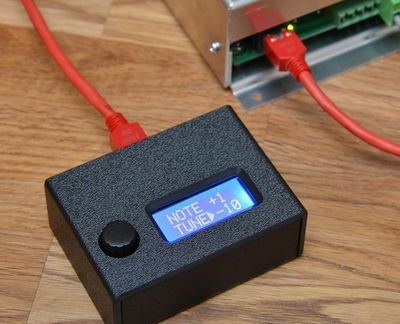 Turn encoder knob to change transpose note. Press knob again to activate tuning mode and to go back to locked mode. Setting is saved permanently (even when disconnecting the PCC or power cycling the organ) when locked mode is re-entered. Note: First series of SWC/SQC-60 just toggle between transposing and tuning mode. It is possible to fine tune the organ even when transposed. The PCC allows transposing of 6 half note steps up or down. Dependant on generator condition, the whole range may not be achieved on every generator; this is not a fault of SWC-60/SQC-60 nor the PCC. Run motor may stall if range exceeded and organ must be restarted thereafter. Also, there is a chance to overheat the run motor. Please note that vibrato frequency also changes with transposing. Also the organ may sound somewhat dull in extreme transpose positions due to fixed generator filter frequencies.